The final preseason game has been played, roster cuts are finalized, and barring any last-minute surprises, the team we see now is the team we’ll see on opening night, Consequently, it’s a good time to review the preseason. Basically, I’m looking at what units/players surprised and disappointed and how that might affect the overall team’s performance. I’ll start with what I felt were the biggest surprises. Click to enlarge if you want. I’ve highlighted the Eagles in green. 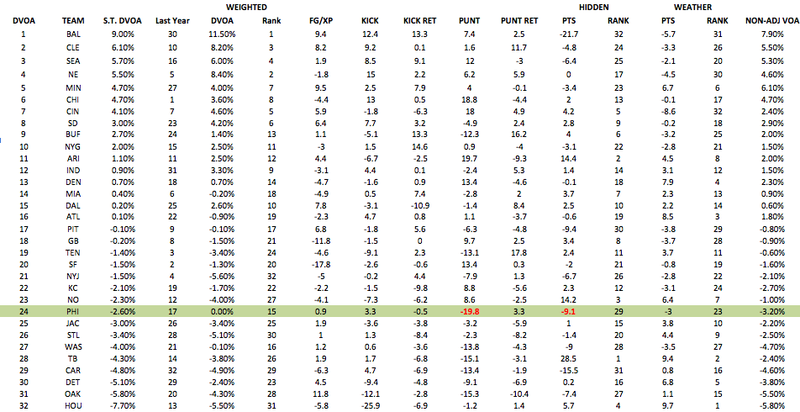 I’ve also highlighted two specific measures, “Punt” and “Hidden Pts”, by bolding them in red. Both of these stand out as the 2012 Eagles’ biggest ST weaknesses. The “Punt” category is self-explanatory, and we’ve seen significant improvement in the preseason. The “Hidden Pts” measure refers to elements of the game that are outside the Eagles’ control. So things like opponents’ field goal %, opposing kick distance, etc… That category is likely to improve as well. Throughout the preseason, the defensive line looked a lot stronger than I thought it would be. Perhaps I had lower expectation than everyone else, but I did not think the team would make the 3-4 transition as well as it has along the line. We knew Cox would be good (despite some early issues), but beyond that, there were a lot of question marks. Now, aside from Sopoaga, I’m legitimately happy with the overall group. In fact, I think it’s the deepest unit on the team. Vinny Curry still confuses me; he’s consistently disruptive but the coaches didn’t seem to even consider elevating him on the depth chart. He must not be doing something he’s being asked to, but that’s hard to see on the tape. Bennie Logan, if you recall, was the Eagles draft pick I liked the least. From all accounts, it seemed like the Eagles chose him almost a full round early. However, he’s definitely showed signs of being a valuable contributor. I don’t know if he can hold up as the starting NT over a full season, but if he can, he’ll supplant Sopoaga by the end of the year. Regarding Sopoaga, I’d like to remind everyone that he is exactly as we expected him to be. HE WAS NOT GOOD LAST YEAR. We knew this. Nobody should be surprised by his underwhelming play. However, the team was converting to the 3-4 and it was imperative that they added someone with NT experience. That’s what they got. I’ve seen some speculation that he’s “saving it” for the regular season, but that seems like wishful thinking to me. At best, he’s a mediocre NT. Rather than be disappointed by that, remember that he’s just a place-holder until the team can fill his role permanently (maybe with Logan). Again, we’re talking about performance relative to expectations. Essentially, I expected very little from this group. Barwin was a “big” addition, but is recent play didn’t seem to match his reputation. He’s looked good, and should provide at least competent play at the OLB position. Mychal Kendricks might be the team’s biggest potential “surprise” this year. We all saw his potential last year; at times, he looked GREAT. However, he also struggled with poor tackling. Shifting to the 3-4, he’s now moved to the ILB role. As of right now, it looks like it suits him pretty well. Depending on how the D-Line plays, I think Kendricks can be an EXCELLENT pass-rusher/blitzer. Outside of Cox, Kendricks has the most “upside” of any defensive player on the team, and nothing he did this preseason has changed that analysis. The Cole/Graham experiment has worked out about as well as everyone thought it would. Both guys can be passable OLBs. However, given Graham’s potential as a pass-rusher, I still believe his “future” lies with a 4-3 team. He’ll be a valuable DE in Nickel situations, but I just don’t see him playing a big role in the team’s OLB plans beyond this year. Trent Cole, by virtue of his age, doesn’t really have a “long-term”. He’s in a similar situation to Graham, in that his best use is clearly as a 4-3 DE. The good news is that attempting to shift both from DE to OLB could have been a DISASTER. The preseason dispelled some of those concerns. I don’t think this unit is getting enough press for underwhelming play. To be clear, they’ve been mostly GOOD, and nothing to be concerned about. HOWEVER, I thought this would be a real strength of the team. Getting Jason Peters back healthy, adding a top 5 OT in the draft, and moving Herremans back to guard all seemed like very positive moves. All told, I thought we might be looking at one of the best OLs in the league, depending on how well Lane Johnson played. I think it’s time to ratchet those expectations back a bit. Peters didn’t play much in the preseason, so he’s got the most “uncertainty” regarding his expected level of play. Still, I think everyone might be putting too much weight into his 2011 performance. He was DOMINANT, especially in the run game. Is it possible that a ruptured Achilles tendon robbed him of some of his explosiveness? Absolutely. I still expect a very good year from him, but it’s dawned on me that expecting him to again be among the best OTs in the game may be too optimistic. Hopefully I’m wrong, and he’s just gearing up for the regular season, but it’s possible. The Herremans/Kelce combo is a larger concern. Everyone seems to remember Kelce as a very good center, but in fact, his rookie season was fairly inconsistent. He certainly showed the ability to be consistently good, but I think his “rep” surpassed his actual play. Similarly, Herremans at G was expected to be VERY GOOD, not just solid. Lane Johnson is too tough to evaluate at this point, but he looks to be playing in-line with expectations. He’s going to look great at times, and struggle every now and then as he adjusts to the NFL. The TEs (really Chip Kelly’s use of them). This might be premature, since it’s likely that Chip Kelly hasn’t even come close to revealing his main playbook. However, I have to say I was disappointed by the overall use of the TEs throughout the preseason. I expected that to be a focal point of the offense, and it wasn’t. I really liked seeing Harbor/Ertz lined up in the slot (and targeted), but it just didn’t happen as often as I thought it would. Ertz, in particular, seemed underutilized in the passing game (6 catches total), though it was hard to tell if that was based on coverage or play-design. On the other hand, Celek looks good, and could finally put up statistics that match his purported “ability”. With D-Jax on the outside and a heavy rushing attack with Shady/Brown, I doubt many defenses will be able to pay much attention to Celek. This entry was posted in General, Player Evaluation by Brent. Bookmark the permalink.